B making it home on the train on his own from school! Three trains were involved in the journey, but it all went swimmingly well and he arrived at his final destination looking very grown up and pleased with himself. D and I had a great night out a couple of weeks ago at The Lancashire Hotpots gig in Derby. Just like last year, it was such a fun night, with lots of singing and dancing along with the hilarious songs. I then had a lovely Mother’s Day – it was so good that we could all be together for it. 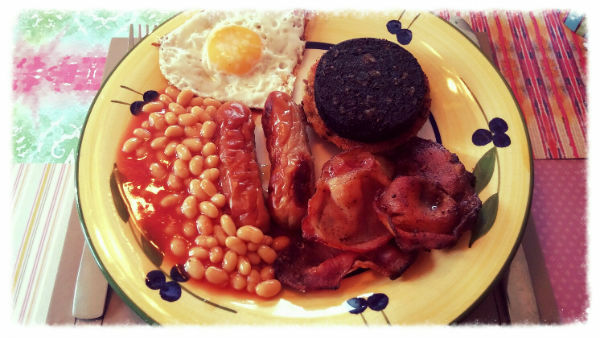 One of the highlights was the huge brunch which was cooked for me – so delicious! 4. G was out at a friend’s party last Friday after school until about 9.30pm, so D and I took the opportunity to have a lovely Caribbean meal (G isn’t keen on spicy food so we tend to avoid it when she’s eating with us) followed by a few episodes of The Good Wife. It was nice to have some time for just the two of us without work interfering, as it usually does during the week. 5. We then had an early start the next day, as it was B’s Parents Morning at school, so we drove up to Lancaster for that. It was a really good morning – apart from suggesting that he puts more effort into chemistry and physics, the reports were so positive and lovely, and it was great to meet his teachers, who we obviously don’t usually see. 6. The weather this week definitely deserves a mention! It has felt so much more spring-like and we have seen far more of the sun, so this has certainly cheered up the dog walks. 7. I had a great night out on Tuesday with two really good friends, first eating in Zizzi, before then going to watch a performance of “Look Back in Anger” at Derby Theatre. Honestly, I have never seen a poor production at this theatre, and this was no exception – the performances were truly amazing, and the direction by Sarah Brigham, was, as always, fantastic – very gritty, intense and thought-provoking. 8. I’ve devoured more great books over the past couple of weeks – I seem slightly obsessed with psychological thrillers at the moment – so I have loved Samantha Hayes’ You belong To Me, Sinead Crowley’s Can anybody Help Me? and am currently reading Sophie Hannah’s Kind of Cruel. 9. I have been thankful for the fact that my work allows me to be there to look after the children if they are unwell, as G has been for the past two days. She has had a temperature, with very sore head, throat and ears, and has not been able to go to school, so I’m grateful to be able to stay at home with her, providing cuddles, drinks and lots of soup. 10.Short hair! I decided this week, after deliberating for a while, to have my hair cut short, and I am really pleased with it. I haven’t had it this length for a very long time but I just felt ready for a change. So, we are hoping that G starts to feel much better soon, as we have a family weekend ahead celebrating B’s birthday, which is on Monday. He is coming home tonight, then he and G are doing the “Closer to the Edge” activity in Markeaton Park tomorrow, followed by a meal at B’s choice of restaurant, so it should be fun. It’s been a pretty quiet week here, in part due to the fact that D has been suffering from the dreaded “man flu” – I think that we are all pleased that it now seems to be on its way out and he’s getting back to normal! Thank goodness for small mercies. 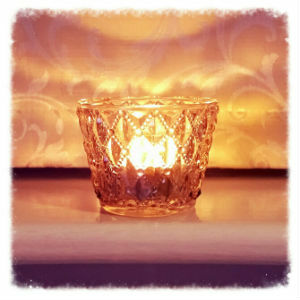 I bought some lovely new tealight holders for the newly decorated sitting room last week. They are grey glass and are so pretty – I’m really pleased with them. 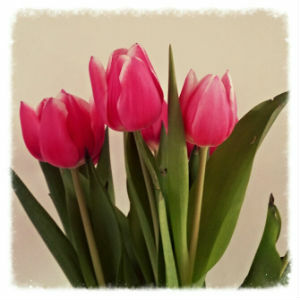 A couple of weeks ago it was daffodils, but this week it’s tulips! I absolutely love them and am looking forward to having them brightening up the house for the next few weeks. Last Friday saw D and I heading out with some work colleagues for a meal and drinks. It was a good night – lovely food and great company – although I am grateful for the fact that we had to get back in good time for G and her friend, as I know I wouldn’t have been able to stay out until after 3am like the others! So this was followed by a very quiet weekend, which was no bad thing. I think that we are all grateful to have one like this every now and then to get on top of things and relax, without having a huge to-do list or lots of places to be/go. The weather is definitely improving (apart from Wednesday, which was absolutely freezing!) and I am certainly feeling much more like spring is in the air on my dog walks now – hurrah! Since my recent bout of de-cluttering and organising in the house, I am definitely feeling so much happier with it. It suddenly seems so much easier to keep it tidy, so I am loving coming downstairs in the morning or back from work or even going from one room to another and seeing everything so tidy and organised. I had another trip to the library last week and stocked up on some more great reads. This week’s so far have been Kill Me Again by Rachel Abbott and Until You’re Mine by Samantha Hayes. Fantastic, both of them! After completing my training course a couple of weeks ago, I had my first morning of proper volunteering at the hospice this week. I have been assigned to the craft table, which I am really pleased about, as it will give me something very definite to do. Everyone was very friendly – it was just a shame that it was very quiet when I was in on Tuesday morning, so there wasn’t as much to do as there will be going forwards. I made two rash purchases this week – new cardigans which I saw in the sale! One is great for work – a lovely green which looks good with black – and the other(which I’m wearing right now!) is big, soft and snuggly, so perfect for home. Very pleasing buys! We have a lovely weekend ahead, which we are very excited about. Not only is B home for the weekend (first time coming on the train, so we will all have everything crossed today! ), which is lovely in itself, but D and I are also going out on Saturday night to see The Lancashire Hotpots (just hoping that it is as fantastic a night as last year!) and then it is Mother’s Day. What a perfect weekend!